Seeing a home without an agent at all is usually impossible as the seller’s agent will need to be present to supervise the viewing. However, you can get away with seeing a house without a buyer’s agent in most cases. 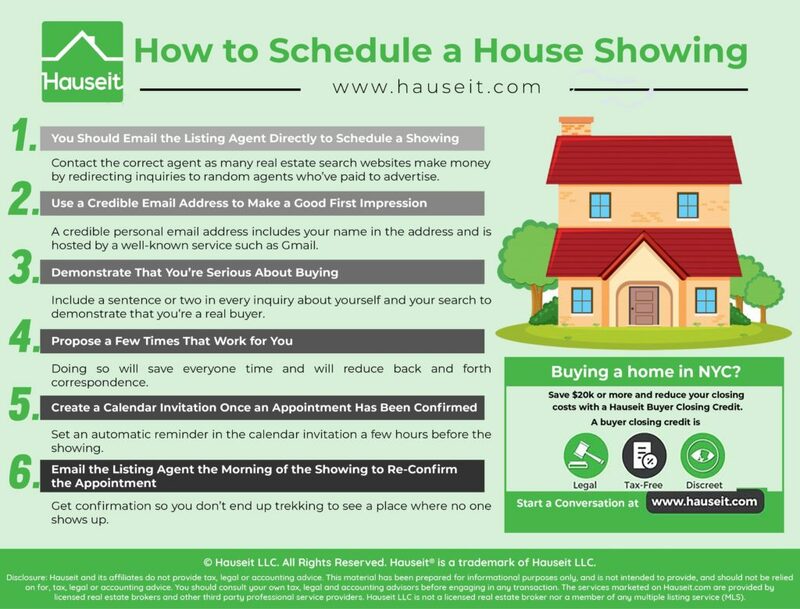 We’ll teach you how to properly schedule private showings by yourself, and how to conduct yourself if you’re scheduling directly in order to save your buyer agent some time. 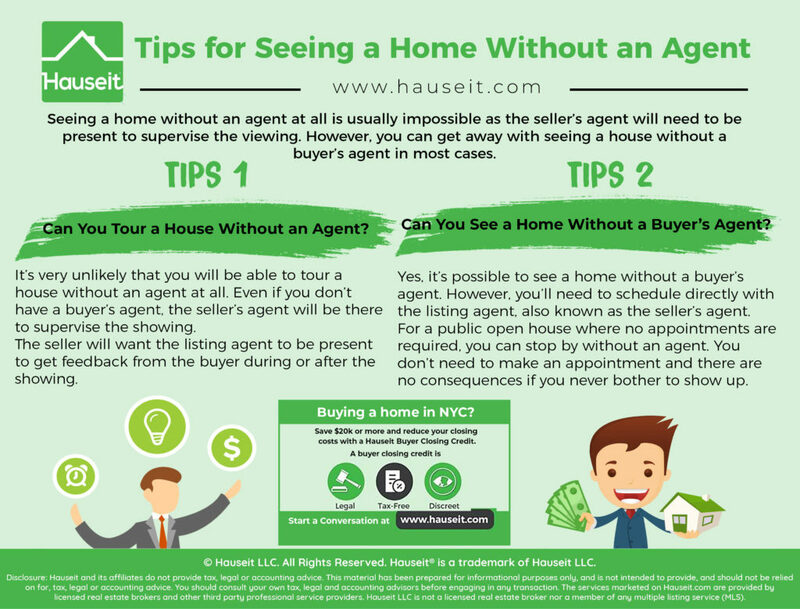 Can You Tour a House Without an Agent? Can You See a Home Without a Buyer’s Agent? It’s very unlikely that you will be able to tour a house without an agent at all. Even if you don’t have a buyer’s agent, the seller’s agent will be there to supervise the showing. The seller will want a licensed and accountable real estate professional there at the showing for security purposes. This will especially be the case if the seller will not be present or no longer lives in the property. The last thing the seller will want is for a complete stranger who inquired with a random email address to show up at the property unescorted. Furthermore, the seller will want the listing agent to be present to get feedback from the buyer during or after the showing. If no agents are present, how will the seller get any sort of feedback easily? Pro Tip: Who delivers your offer to the seller if you don’t have an agent? Read our article to learn more about what’s customary during the offer submission process, and why it may not make sense to pass on a buyer’s agent. Yes, it’s possible to see a home without a buyer’s agent. However, you’ll need to schedule directly with the listing agent, also known as the seller’s agent. If you contact a listing agent directly, he or she will try to convince you go make an offer without representation under what’s known as dual agency. Dual agency basically means the seller’s agent will represent both parties, and will collect both sides of the commission, or 6% of the sales price. In suburban parts of the country such as Westchester County in New York where digital lockboxes are commonly used, you may not be able to view a property at all without a buyer’s Realtor. That’s because only Hudson Gateway MLS members can access properties under a digital lockbox in the Hudson Valley, and since listing agents generally don’t bother to show properties themselves when there is a lockbox, you really do need a buyer’s Realtor to see the vast majority houses in this situation. Of course, none of this applies if you stop by a public open house where no appointments are required. You can stop by without an agent at an open house, you don’t need to make an appointment and there are no consequences if you never bother to show up. Pro Tip: Read our article on how to buy a house without a Realtor if you’re intent on bypassing a buyer’s agent. Keep in mind that just because you avoid a buyer’s agent does not mean you’ll be able to avoid a seller’s agent as most listings are marketed by real estate agents. You should email the listing agent directly to schedule a showing. Make sure that you are contacting the correct agent as many real estate search websites make money by re-directing inquiries to agents who have paid to advertise on the site. These sites can go so far as to make the “contact agent” button extremely vague, so that only after you click submit do you know whom you contacted, and only after further digging do you realize that the person you contacted is not the listing agent. Use a credible email address to make a good first impression. Ideally, you should use your work email especially if you work at a large, well known corporation. Otherwise, feel free to use a credible personal email address that ideally includes your name in the address and is hosted by a well-known service such as Gmail. For example, john.smith@gmail.com would be better than ng487bb@yandex.com. There’s nothing necessarily wrong with Yandex, but they are without a doubt less well known than Google. Furthermore, the second email address looks spammy as it contains a random assortment of numbers and letters vs the person’s name. Demonstrate that you’re serious about buying. You should include a stock sentence or two in every inquiry about yourself and your search. If you’re buying all cash, putting down a large down payment or even if you’re just pre-approved for a mortgage, make sure to let listing agents know. If you’re in contract on your old home and are seriously looking to buy a new place, then let them know. While you don’t need to provide any documentation at this stage, it’s nice to demonstrate to the listing agent that you’re quite serious and won’t be a waste of time. Propose a few times that work for you. Doing so will save everyone time and will reduce back and forth correspondence. This is a much better strategy than simply asking when they can show the property. If you’re going to inquire on a listing, you might as well propose a few times that work for you in that initial email. Don’t be afraid to pick up the phone. If you find yourself emailing with the listing agent back and forth to try to nail down a time, try calling the listing agent instead. Or better yet, email the listing agent with your phone number and ask them to text you when they’re free to speak. This is much better as very few people pick up calls these days from unknown numbers, even real estate agents. Create a calendar invitation once an appointment has been confirmed. Make sure to invite yourself, your spouse and any other co-buyers as well as any agents involved to the event. Set an automatic reminder in the calendar invitation a few hours before the showing to remind everyone to show up. Not only will this be very helpful in terms of scheduling for everyone, it’ll make you look more serious as a buyer as well. Email the listing agent the morning of the showing to re-confirm the appointment. While this step is optional and rarely done even by the most seasoned of listing agents, it’s a great way to make doubly sure that the appointment is still on. While rare, sometimes a listing agent might have encountered some sort of an emergency and hasn’t had time to cancel your appointment yet. As a result, this is a great way to get confirmation so you don’t end up trekking to see a place where no one shows up to let you in. Pro Tip: Is there an advantage to not having a buyer’s agent in NYC? Read our article to learn more and see us debunk this popular notion by first time home buyers. Many discount rebate brokers will expect you to do your own scheduling and to view properties by yourself, especially if you’re getting a significant chunk of the buyer’s agent’s commission. However, you’ll want to be very careful in doing this, even if you’re not getting a rebate and are simply trying to save your buyer’s agent some time. Stop by open houses which don’t require an appointment. Open houses are by far the most preferred method to view properties. There is very little pressure from any party, and most actively marketed properties will host an open house for at least a couple of hours every Sunday. When you stop by, you can even list your buyer’s agents contact information instead of your own on the sign in sheet. This way, listing agents won’t be able to solicit you and add you to newsletters and mailing lists. Schedule directly without immediately revealing that you’re represented. This is a bit sneaky of a tactic, but highly effective. You essentially contact the listing agent directly without discussing the status of your representation, if possible. If you don’t like the property once you’ve seen it, then there’s nothing to do anyway. If however, you do like the property and want to make an offer, you can introduce your buyer’s agent to the listing agent by email after the showing. In fact, there’s no harm in telling that listing agent that your buyer’s agent will be in touch during or at the end of the showing! Ask your buyer’s agent to schedule on your behalf. This is the most time consuming (for the agent) but most traditional method. Since you’re already getting part of the commission that your buyer’s agent would normally earn, you should try to save your buyer’s agent some time by only asking for help scheduling listings that absolutely do not have an upcoming open house and which you really are interested in. Ideally, you should only ask for help scheduling second showings for properties you’re serious about after you’ve already seen it once by yourself. Be discreet about your rebate arrangement. The last thing you’ll want to do is to tell the listing agent about your grand commission rebate plan. The listing agent will be furious to find out that not only is the buyer’s agent not doing any work (so far), that he or she is finding clients by offering what they view as a kickback scheme. Often times this can’t be avoided, especially if you are working with a broker who openly discounts or who offers rebates as their public business model. It’ll be much too easy for the listing agent to Google the name of your broker to see exactly what they’re up to. As a result, it’s much better to work with a local, Hauseit partner broker who has discreetly agreed to offer you a commission rebate. 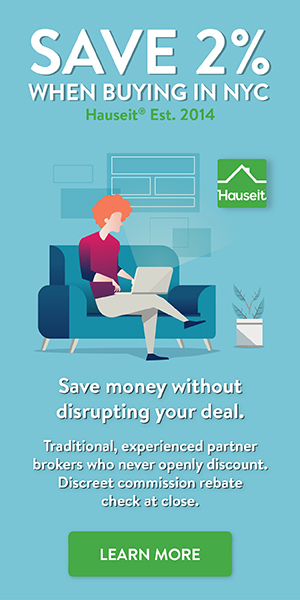 Our partner brokers never have to openly discount their services because they get referrals through Hauseit, which is a marketing company that spreads the word about how to save money on commission. Just remember, there won’t be any issues as long as your buyer’s agent submits your offer and negotiates on your behalf. Doing so typically means they are the procuring cause of the deal, even if they didn’t show up to the viewing. Just remember, it’s better to work with a traditional broker who gives you a rebate discreetly vs working with a discount broker who’s loud about disrupting the industry. What if the only thing a discount broker disrupts is your chance of getting an accepted offer? Pro Tip: What exactly is a commission rebate? Read our comprehensive guide to getting a buyer agent commission rebate explained to learn all about it.